Artists: Beck, Billie Eilish, El-P, Ibeyi, Jessie Reyez, Laura Marling, Patti Smith, T Bone Burnett, Unkle, et al. For fans of the movie Roma, this album is an interesting exploration of how others interpret the movie. 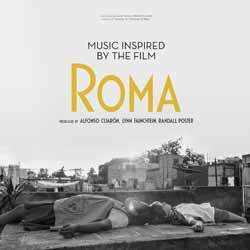 For some, Roma inspired new originals, including Billie Eilish’s 'When I Was Older' which, like most of the original songs contributed to the collection, incorporates various sound elements from the films audio tracks. From shouts of student protests to barkings of Borras to the grinding of knives, artists drew inspiration from the cinematic sonic landscape. Over the course of this album's 15 songs (58 min, 06 sec) 16-year-old Bu Cuarón makes her musical debut with her contribution 'Psycho', opening with a dramatic audio clip from the film before descending into a synth-heavy, electro-pop track. Beck contributes a reimagining of 'Tarantula', a 1982 B-Side by 4AD artists Colourbox. British singer-songwriter Laura Marling covers the Mary Hopkin original 'Those Were The Days', which is heard in the film as a cover by Ray Conniff & The Singers. The legendary Patti Smith records a new version of her 1996 track 'Wing', while French musical duo Ibeyi draws inspiration from the character of Cleo and her story. The album closes with renowned producer, musician and songwriter T Bone Burnett’s 'Roma'. From hip-hop’s El-P to R&B breakout Jessie Reyez and electronic producers UNKLE and DJ Shadow, the remainder of the collection is a diverse tapestry that transcends genre, geography and age. It's an interesting collection that is sure to find a wider audience outside those that have seen the movie.